In the early spring, it's easy to be inspired by the elegant shape of a fiddlehead fern as it unfurls to reveal its woodland wonder. It's also easy to be inspired by this amazing Vera Wang gown, fashioned out of layers of sheer satin-faced organza, and embroidered with giant ferns of antique silver bullion thread. Our Vera Wang Fine Papers designers fell so madly in love with this embroidered effect that they just had to find a way to recreate these gorgeous ferns on a Vera Wang invitation. 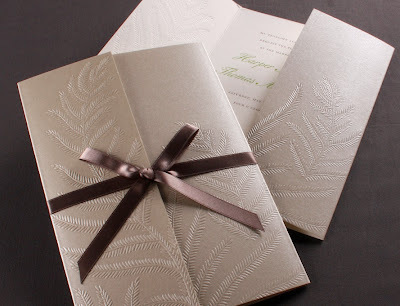 And, that they did—by embossing our Vera Wang Embossed Fern Invitation with sweeping fronds of ferns on paper that is silk-screened with a shimmery, taupe bronzed ink. The chic shimmer is a nod to the subtle iridescence of the embroidery in the gown. And, the embossed ferns add the perfect tactile element to the gatefold design that opens to reveal a warm, oyster-white invitation with elegant typestyles. And, just like the refined knotted waist of the Duchess-satin gown, it's finished with a lovely taupe bow wrap. 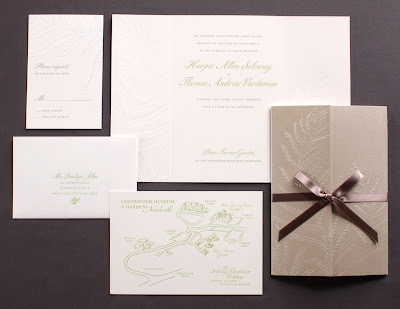 A beautifully inspired invitation, indeed! 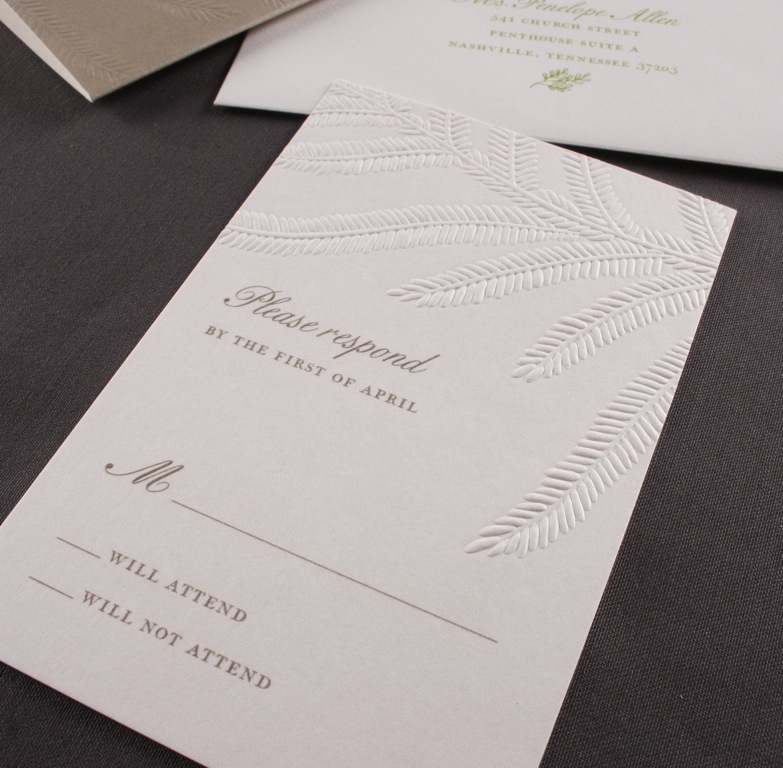 A subtle, blind-embossed fern motif graces the matching reply cards. We love this invitation for garden-themed or outdoor weddings! Please note that customer-supplied art like maps, are available with the Embossed Fern Invitation suite through our select retailers. See another Vera Wang gown-inspired invitation here.